The recent release of the critically acclaimed documentary ‘Bobby Fischer Against the World’ has sparked renewed interest in the late former World Chess Champion, arguably the greatest player of all time. Fischer’s life reads just like a film: child prodigy, US Champion, Grandmaster, World Title Challenger, Cold War warrior, all-American hero, World Champion, the wilderness years, the 1992 comeback, US sanctions, Holocaust denial, anti-American diatribes, and finally dying in obscurity in Iceland in 2008. Among chess players and non chess players alike, Bobby Fischer is perhaps best known for his 1972 World Championship match against Boris Spassky of the Soviet Union, played at the height of the Cold War, a match he might not have played had Henry Kissinger, not oblivious to the political mileage to be made, not persuaded him. Winning the World Chess Championship proved the peak of Fischer’s fame and stature however; everything went downhill from then on. Yet no chess player before or since has been able to capture the public imagination in the way Fischer did. Few have been capable of producing chess as sublime, or of provoking such adulation and repulsion in equal measure. Over the next few weeks it is my hope to shed some light on a complex, controversial and tragic character. Each week, I will be dedicating an article to a particular period in Bobby Fischer’s life. In this first part, I explore his beginnings and his rise to chess stardom. Robert James Fischer was born in Chicago 1943. His parents divorced when he was still a toddler and he would grow up without a father figure, instead being brought up by his mother, a domineering woman of Russian Jewish extraction and, ironically given later events that would shape Fischer’s life, a communist sympathiser who had managed to attract the attention of the FBI during her son’s early chess career. Fischer’s introduction to chess was a fairly inconspicuous one. He learned how to play the game at the age of six after his elder sister bought a chess set from a local store along with other games in order to keep him amused. Thus began a life-altering obsession that would sow the seeds of his groundbreaking achievements and, arguably, his eventual fall from grace. 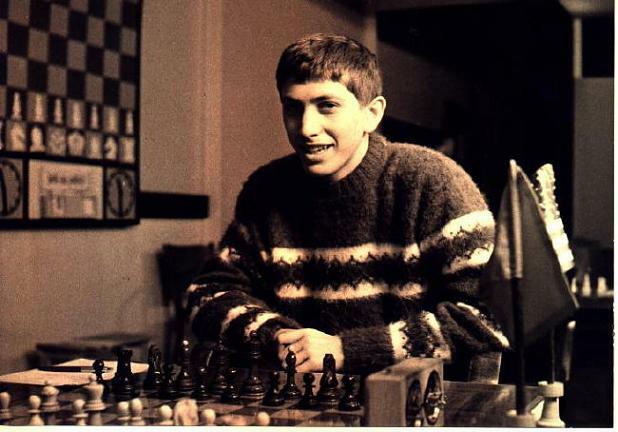 It may be said without exaggeration that from the moment he picked up his first piece, chess would go on to shape Bobby Fischer’s entire development: intellectual, social, emotional and psychological. Fischer’s natural talent and zeal for the game soon became apparent to those around him, particularly his mother who was keen to nurture her son’s gift. Not that Fischer needed any pushing; he was already independently studying chess literature with an ultra-seriousness that would remain a lifelong trait. Fischer’s supreme self-confidence was also apparent at this early stage, in addition to being a perennially bad loser who would sometimes burst into tears or throw pieces if he lost a game. He found himself easily bored at school and was contemptuous of his peers and teachers, displaying the arrogance he would become notorious for. At the age of twelve, Fischer joined the world-famous Manhattan Chess Club, one of the oldest and strongest chess clubs in the United States. Counting many leading masters as regulars and with its legendary reputation, entering the club would have been a daunting experience for any chess player, let alone a twelve year old boy. Fischer, however, refused to be intimidated, and quickly won the respect of the Manhattan’s players. As if to prove his point, in the same year that he joined the Manhattan Chess Club he came fifth in the Greater New York open championship, further raising eyebrows. 1956 would be a watershed year for Fischer. At the age of thirteen he became the youngest ever winner of the US Junior Chess Championship with 8½/10. The defining moment came however in the Rosenwald Tournament, held at the Marshall Chess Club in New York. Fischer was one of a group of twelve players invited to participate which included the likes of US Champion and former child prodigy Samuel Reshevsky, one of the world’s best players and already a living chess legend in his own right; a boy wonder of the 1920s who had played simultaneous games at the age of six and beaten a World Championship candidate at the age of ten. However, eyes were now fixed on the new upcoming prodigy. In round 8, Fischer found himself drawn against Donald Byrne, one of the strongest players in the US at the time. Byrne had himself been a talented junior player, having achieved fourth place in the 1946 US Open at the age of sixteen. In the 1954 USA versus USSR match held in Moscow, he had shocked the Soviets by wiping out Grandmaster Yuri Averbakh over the board. To make things more difficult for Fischer, he found himself playing against Byrne with the Black pieces. Fischer demonstrated no fear and opted for the Grunfeld Defence, an ultra-aggressive response. Byrne did not shirk the challenge and played an energetic counter-variation. However, on move 11 he made his first mistake of the game. D. Byrne-Fischer, Rosenwald Tournament, New York, 1956. After 11.Bg5? In the position to the right, Fischer responded to Byrne’s inaccuracy brilliantly with the counter-attacking 11…Na4!! The knight is taboo, as after 12.Nxa4 Nxe4 Black is better regardless of whether White responds with 13.Qxe7 Qa5+ or 13.Bxe7 Nxc5 14.Bxd8 Nxa4. 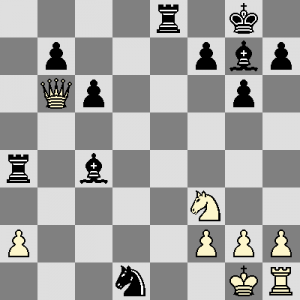 Fischer now unleashed the Queen sacrifice 17…Be6!! 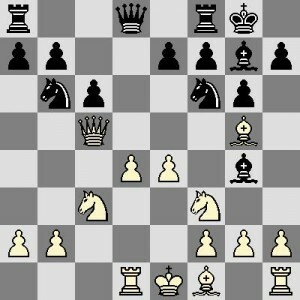 This was, without doubt, one of the most stunning moves ever played, regardless of the fact that it is largely forced. What makes it remarkable is that the thirteen year old Fischer must have calculated and seen 17…Be6 on move eleven when he played Na4. A ‘windmill’ of discovered checks now follows which results in a decisive material advantage. At the end of the carnage, Black has a rook and two minor pieces in return for his sacrificed queen. 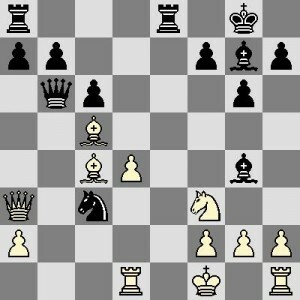 In addition to the material deficit, White’s king is virtually defenceless. Finishing off is now elementary and Fischer proceeds to do so with ruthless efficiency. Seeing that the end was nigh, Byrne sportingly allowed Fischer to checkmate him, and, with a gracious smile on his face, offered the teenager his hand in a congratulatory gesture. For the first time, Fischer’s name was propelled into national and international headlines and the thirteen year old became an overnight sensation. The chess journalist Hans Kmoch coined the brilliancy against Byrne as ‘the game of the century’ and chess magazines devoted pages of analysis to the game. Although Reshevsky easily won the tournament with 9/11, he must have known that his position as America’s best player could no longer be guaranteed for the remainder of the decade. Within the space of a year, Fischer’s chess rating and reputation had exploded and a star was born. The following year in 1957, Fischer competed in the US Chess Championship for the first time. Given Fischer’s youth, this was itself considered something of an honour. Expectations were high for the young talent, but Fischer was still not expected to win. However, against all the odds, Fischer produced an incredible performance to score 10½/13 with eight wins and five draws, dethroning Reshevsky and becoming the youngest US Chess Champion at the age of fourteen, a record that still stands today. The changing of the guard had come earlier than anyone could have expected. As a consequence of winning the US Championship, Fischer, now an international master, was eligible to participate in the 1958 Portoroz Interzonal, Yugoslavia. The top six finishers would qualify for the Candidates Tournament which would determine who had the right to challenge the World Champion Mikhail Botvinnik. Fischer’s achievements had thoroughly astounded the chess world, but many were still sceptical about his chances in a tournament of the Interzonal’s calibre. Fischer had demonstrated that he could hold his own against world class players, but at Portoroz he would be facing not one but a whole field of world class players and experienced grandmasters that included the likes of Mikhail Tal, David Bronstein and Tigran Petrosian. In stark contrast to the sceptics, Fischer was typically confident, even arrogant, about his chances in the lead-up to Portoroz. He expressed contempt for some of his fellow competitors and referred to them in highly derogatory terms. Behind this disrespectful demeanour however lay countless hours and late nights of painstaking opening preparation and deep analysis, with Fischer even having gone so far as to peruse Russian language tournament bulletins to ensure that he was adequately prepared. He had every right to be confident going into the tournament. By the final round of the Interzonal, Fischer was on 11½/19, the same number of points as Bronstein, the man who had played Botvinnik for the World Championship in 1951 and missed out on victory on that occasion by just half a point. Fischer’s final round opponent was the no less formidable home favourite, Yugoslav grandmaster Svetozar Gligoric. Characteristically, Fischer went all out for the win. 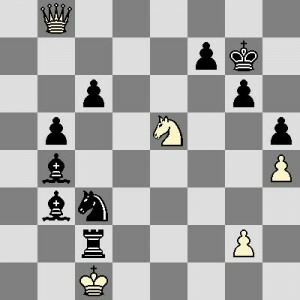 He played the Sicilian defence in response to Gligoric’s 1.e4 and then opted for an extremely rare variation which he had specially prepared, surprising Gligoric and gaining an advantage. However, one of the shocks of the tournament then occurred when Rudolfo Cardoso, a rank outsider, forced Bronstein’s resignation. Knowing that he no longer had to win to go through, Fischer accepted a draw to finish in joint fifth place with 12/20 and qualify for the Candidates Tournament. In a rare moment of humility after the tournament, he described Bronstein as a great player, and declared that finishing above him in a tournament was his finest chess achievement to date. In the wake of his performance, Fischer was awarded the grandmaster title at the age of fifteen, the youngest ever at the time, setting a record that would last for thirty three years. Incredibly, the Candidates Tournament and a possible shot at the World Championship now beckoned for the precocious T-shirt and shorts-clad teenager.